Taiz, Yemen (CNN) It is a war you rarely see, but one that defines the US’ relationship with Iran and Saudi Arabia in the Middle East. Rare images from inside Yemen’s city of Taiz show the devastation wrought by months of fighting between Houthi forces backed by Iran and Yemeni government forces, bolstered by Saudi Arabia and its US-equipped air power. 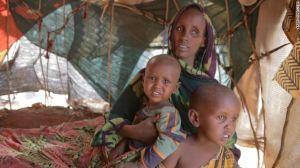 They also expose the startling levels of hunger and disease in a conflict that so often goes unseen, even though a child under the age of five dies of preventable causes every 10 minutes. Mayhoub led Chaim, the photographer, around the city, explaining where the Houthis retained positions from where they could shell Taiz. The conflict in the city has been further complicated as the Houthis’ enemies have begun fighting among themselves, making a reprieve in the violence even less likely. The impact on the youngest Yemenis is also acute, as images from Camp al Mahu — a haven near Lahj — devastatingly show. Here, tiny nine-year-old Mailiki Seif weighs just 2 kilograms, reduced to twigs of bone. Her mother, Mariam, says this is actually an improvement.